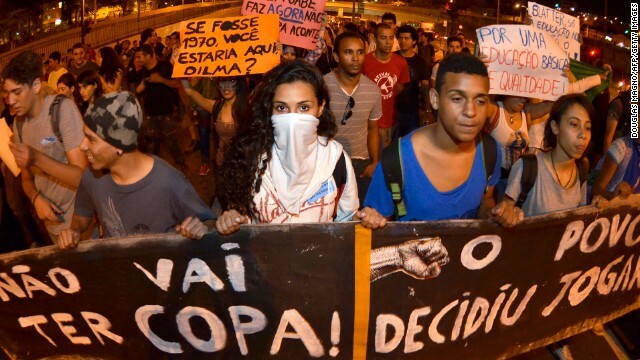 World Cup 2014: Can the FBI help stop Brazil's World Cup protesters? 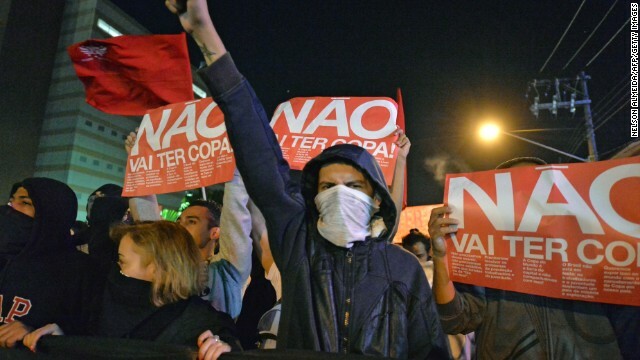 In April, demonstrators hit the streets in Sao Paulo to protest against Brazil's hosting of the 2014 World Cup, which begins on June 12. 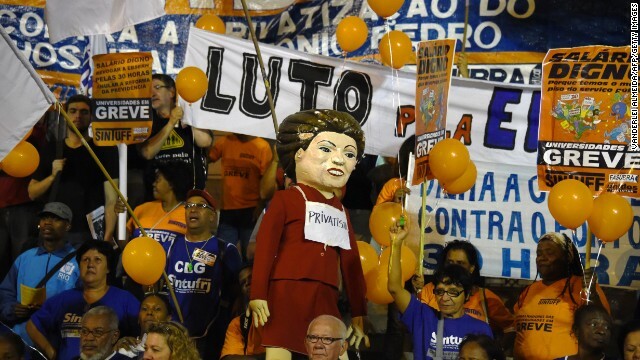 Much of the anger has been aimed at President Dilma Rousseff and her government. Here, education and health civil servants protested in Rio de Janeiro in April against alleged corruption and poor wages. Last June, people took to the streets in Belo Horizonte in the state of Minas Gerais to protest against the costs of hosting the World Cup. Residents run for cover during violent clashes between protesters and Brazilian Police Special Forces in a favela near Copacabana in Rio on April 22, 2014. 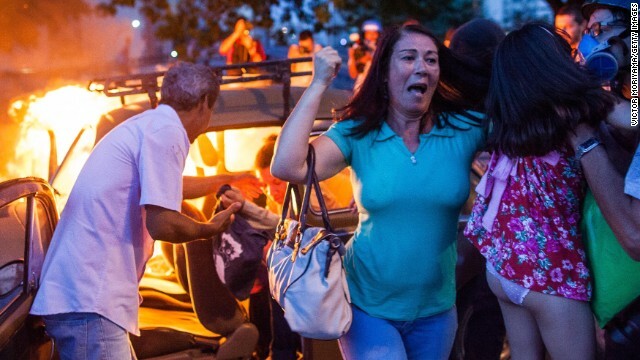 Violent protests broke out in the city's landmark beachfront district following the death of a resident during clashes with the army in a nearby favela. A man walks past with a football in his hand as Brazilian Police Special Forces stand guard in the background during a violent protest in a favela near Copacabana. 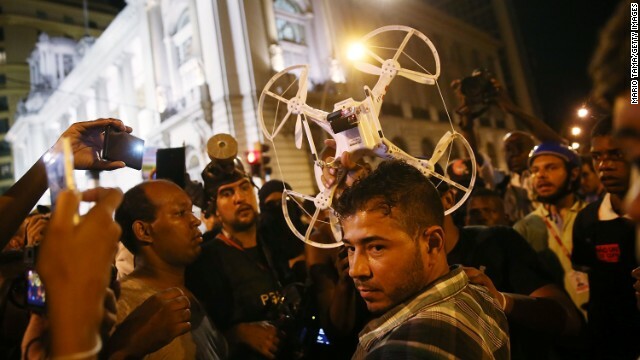 Protesters question a man who was operating a quadcopter drone with camera during February's protests in Rio. 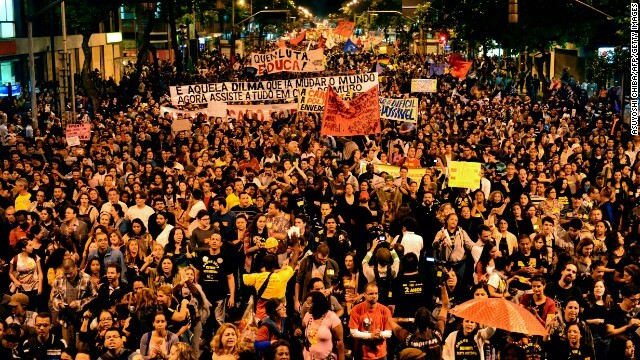 Thousands of people took part in a protest in Rio on October 7, 2013, when Brazilian teachers demanded better working conditions and others demonstrated against alleged police brutality. A demonstrator waves the Brazilian flag during the 2013 protests in Belo Horizonte, where thousands marched. People help a family out of a burning car in Sao Paulo last January after it drove over a barricade of fire started by protesters, during demonstrations against the staging of the World Cup. A masked man joins demonstrators in front of a government building during last October's protests in Rio. 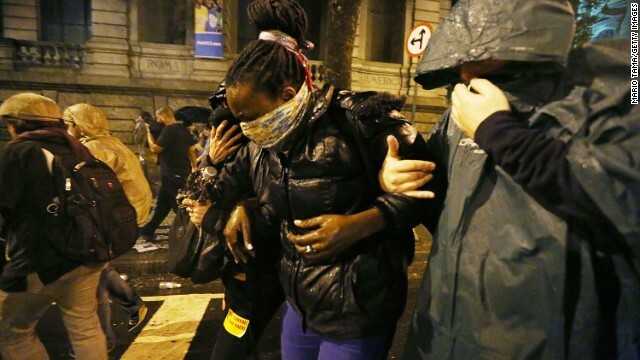 Police have used tear gas on occasions to break up protests, as they did in Rio last October. 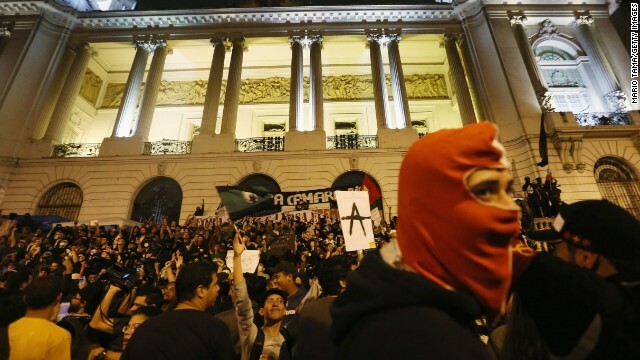 Masked protesters attempted to destroy a gate of the Rio de Janeiro City Hall on October 7. 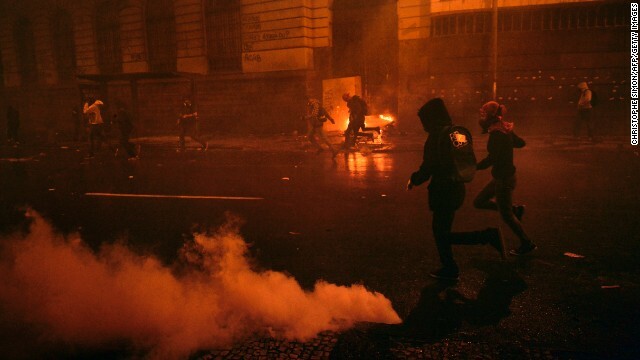 Demonstrators run after riot police used tear gas to disperse the crowds during the October 7 Rio protests. 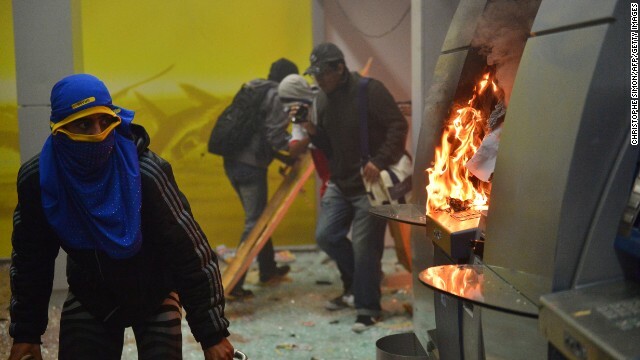 Masked protesters destroyed cash dispensers during the Rio protests on October 7. 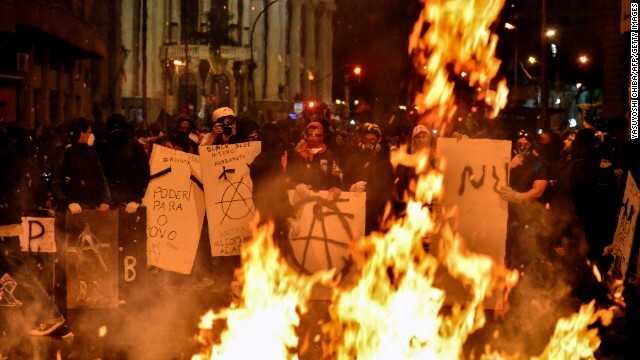 Fires raged outside Rio's City Hall as demonstrators burned trash during the October protests. 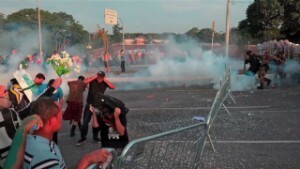 (CNN) -- Rubber bullets, drones and FBI-trained riot police. Welcome to Brazil's 2014 World Cup. One year since millions marched in protest against the government and the staging of the world's most glamorous sporting event, Brazil is steeling itself. Notably in Belo Horizonte, the country's third largest city and home to 5.5 million people. Here, the police are leaving nothing to chance. Last year, as tires burned and protests raged during the Confederations Cup, a warmup competition for next month's football showpiece, the night sky above Belo turned red. The city's authorities are determined that won't happen again, so in March, a week-long training session with the FBI was arranged. "The training with the FBI took place here in Belo where our officers were able to exchange experiences with colleagues and American agents," Patrícia Luíza Costa, chief of the teaching division at the Academy de Policia Civil de Minas Gerais, told CNN. "The FBI agents were here for a week and we had 308 officers registering to take up 43 places." The U.S. Federal Bureau of Investigation has offered advice on a number of areas ranging from organized crime, peacekeeping and the importance of maintaining respect for human rights. "This is the first time an event the size of the World Cup will come to Minas and Belo," added Costa. "But our officers have gained experience from visiting South Africa at the 2010 World Cup and the London Olympic Games. "That allowed us to learn from large events and London is our own example." The Brazilian government is expected to spend hundreds of millions of dollars on security before and during the World Cup. 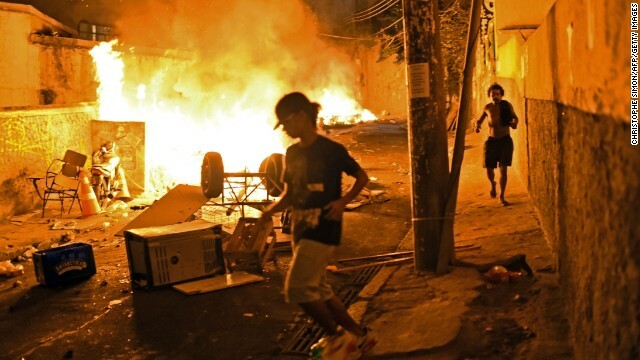 Riots across the country sparked violent clashes between police and protesters on the streets of Belo as well as in Rio de Janeiro, Sao Paulo and other regions. Last month, Brazilian star Neymar told CNN that he supported "peaceful protests." "My opinion is that protesting, there's no problem with it, as long as it is peaceful without violence, without vandalism," the Barcelona forward said. "If it's for Brazil getting better, they have to protest." Neymar's blessing or not, the protests show no sign of going away. 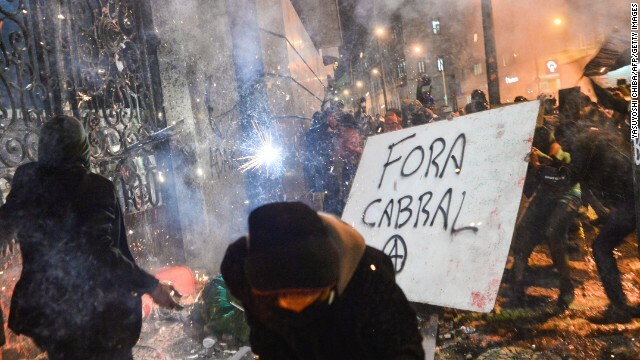 Also in April, CNN reported how an angry mob burned barricades and police blocked streets as clashes flared in Rio's neighborhood of Copacabana, where one person was killed. 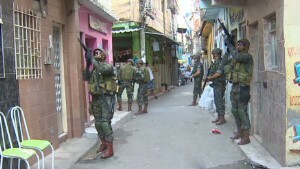 Tensions are high in the favelas surrounding Rio -- police, backed by the army, have carried out a "pacification" campaign to eradicate drug gangs. The program, which has been in action since 2008, is expected to continue after the World Cup finishes. 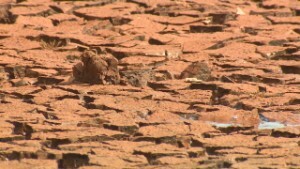 Earlier this month, authorities in Rio requested help from the Brazilian Army. More than 2,000 soldiers and marines moved into the sprawling Complexo da Mare shantytown in the industrial north zone. Away from the favelas, it won't just be soldiers and police keeping an eye on protesters. The government has purchased two unmanned aircraft systems, including a Hermes 900, from Israeli company Elbit Systems to bolster its security during the tournament. "These drones are top of the range and can fly at 30,000 feet while being able to see 70 miles away," explained Justin Pringle, an expert in the field and creator of drone systems with UK-based company Heliguy. "They are purely for defense and fans at the World Cup won't even notice them -- the drones will be flying too high to be noticed. "What they will do is give the police an extra pair of eyes in the sky and allow them to plan and analyze any situations which occur. "They are a far more cost-effective means of policing, and it saves having a manned helicopter in the air." Brazil signed a $350 million deal with Israel in 2009 to supply drones for the World Cup and the 2016 Olympics, as well as to guard against illegal logging in the Amazon rainforest. "The drone business has gone through the roof and there is a huge demand," said Pringle. "We were involved in a project at the Sochi Games using one of our models and we're also involved in several other events as well as movies." While the drone business is doing a roaring trade, Igor Resende is struggling to get over last year's riots, with memories of the rubber bullet that sent him to hospital still as painful as ever. A sports journalist who will cover the tournament, Resende is expecting another summer of discontent as football's showpiece event becomes the focal point for the frustrations of a nation. Allegations of police brutality and corruption within the government have given ammunition to protesters who remain unhappy at the World Cup being awarded to Brazil at a time when they would rather see money being spent on public services. "We have a lot of reasons to protest," Resende told CNN. 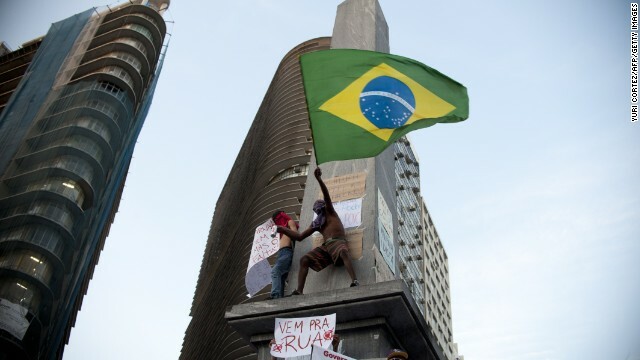 "It all began in Sao Paulo with protests against the price increase of public transportation. It then increased when the police repressed the protesters and a lot of people got injured -- including journalists. "The big question of this World Cup is the money being spent. "People would prefer to see all this money used to build hospitals, schools and nurseries. "Even former players, such as Romario, who is now a politician, has come out and said that he feels betrayed by the government for using public money to build stadiums." FIFA, the game's world governing body, is expecting protests. Its secretary general Jerome Valcke has been broadly supportive of those who seek to demonstrate in a peaceful manner. "We fully respect the right to express your opinion and to protest as long as it is in a peaceful manner and as long as the rights of everybody -- protestors and others -- are respected," he told reporters. "We definitely condemn any form of violence. For the World Cup, a detailed security plan built on models used at previous World Cups will be in place. "It involves private and public security authorities to ensure the safety of fans, players, media and our stakeholders. "This approach worked very well during the Confederations Cup. I trust the job being done by the Brazilian government in partnership with the local organizing committee." 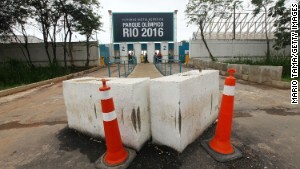 While protests are expected in Rio de Janeiro and Sao Paulo in the lead-up to the tournament, they are unlikely to attract the same number of people as those held last year. Even so, nothing is being left to chance. According to official figures published by the Ministry of Justice, there will be 57,000 members of the armed forces deployed specifically for the World Cup, with 21,000 of those "considered contingency forces." The skies will be patrolled by 48 aircraft, including helicopters and airplanes, while 20 ships and 60 smaller vessels such as speed boats will patrol the seas. In addition, 12 central commands have been set up across the country and Gepard Missile Batteries have been deployed. Further figures made available by the government show that 9,928 police professionals have undergone special training designed for the World Cup as well as the 2016 Olympic and Paralympic Games. "The government is very prepared for security issues," Christopher Gaffney, a visiting professor in the graduate school of architecture and urbanism at the Universidade Federal Fluminense in Niteroi, Rio de Janeiro, told CNN. Gaffney has spent the past five years examining the effect the World Cup will have on Brazilian society and says the government has left no stone unturned in its preparation for the tournament. "There has been heavy investment in military-grade weaponry, the federal government has prepared a 10,000 strong anti-riot force and there will be one security agent for every 50 fans," he said. "What is meant by security is, of course, a different subject as Brazil operates under a military police system which takes the citizenry as potential combatant enemies." Last June, as Belo played host to the Confederations Cup, more than a thousand protesters sat in Praca Sete de Stembro, a square in the city center, chanting against the government and police. "The scale and ferocity of the protests took everyone by surprise," says British journalist and author James Montague, who was in Belo at the time. "The first protest I saw close up was in Rio," said Montague, author of the upcoming World Cup book, "Thirty-One Nil." "It was peaceful. Mainly university students and activists. I had seen how the police, largely unprovoked, just crushed it with rubber bullets, tear gas and flash grenades. All the damage stemmed from that, but you could see the Rio military police had experience in pacification. "Belo Horizonte was different. There the police lost control as the protestors -- some activists but mainly young men who had joined the march from the favelas -- controlled the streets and ransacked them. 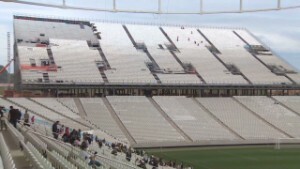 "It took a swooping police helicopter to eventually regain control around the stadium. It was, by the end, basic criminality by a section of the 'protesters.' "
During one of the protests, Montague hid under a corrugated roof as police fired back at protesters and tear gas was unleashed. "A tear gas canister lands at our feet bouncing and spinning around, crazily spewing thick white plumes of smoke in every direction," writes Montague in his book. "The choking fog brings near total silence, save for the coughing and the wailing of those not wearing a gas mask." Writing on his blog, Hunting White Elephants, Gaffney says: "No-one is to blame as the World Cup functions like an extensive shell game of interests that leaves vacuums of responsibility, exposing the least protected to the greatest risk." He adds: "The 'real risk' is to the World Cup, which is why the government puts on massive security performances to show foreigners that they are getting tough on crime and that critical infrastructures will be protected." Gaffney told CNN that while there is some scaremongering by the press, similar to that ahead of the 2010 World Cup in South Africa, there is room for legitimate concerns over security. "There are always overblown elements to media coverage that reflect the fears of the international media and not the realities of the places being covered," he said. "If the World Cup was being held in the U.S. would the British media be talking about random killings at movie theaters? "However, the problem of violence in Brazilian cities is quite real and the most damaging drug is that which will be openly sold in stadiums in violation of Brazilian law, alcohol." However, Camillo Fraga, the municipal secretary for the World Cup in Belo, is adamant that his city will be fully prepared. Home to the 62,000-capacity Mineirao stadium and no less than 12,000 bars, Belo is aiming to market itself as an international tourist destination. The Minas Gerais state, which includes Belo, possesses 60% of the historical and cultural heritage in Brazil, according to the city's tourism publication. Fraga believes the experience of hosting last year's Confederations Cup, and the attention being given to Belo, will allow the city to establish itself globally. "This is the most important opportunity for our city to become international. The people understand that. 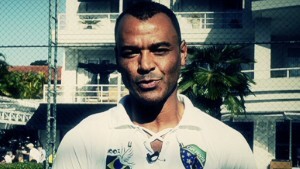 They see Rio and Sao Paulo, they see that they are international cities and we are not," he said. "We are working together with the citizens to try and motivate them to see how it will be good for the city to receive the World Cup." While Fraga is confident that Belo will cope with the extra visitors, there are those who remain skeptical. Protest groups, many of which use anarchist "black bloc" tactics of dressing in uniformed disguises, are expected to use the World Cup as a vehicle to showcase their grievances, before and throughout the month-long tournament. "Brazil will look like it's under marshal law," Montague said. "Armed police will be everywhere, if the Confederations Cup was any indicator -- and they won't think twice about using a rubber bullet to quell even the slightest trouble. "They do not mess around."